I’ve been looking at this recipe for a few months now, all the time trying to find 1″-thick halibut in my local markets. I finally gave up, and used Chilean Sea Bass (which was still 10 miles from my home). The recipe shaves the carrots into thin ribbons so that they cook through quickly, and in the same 10 minute time-frame as the fish. 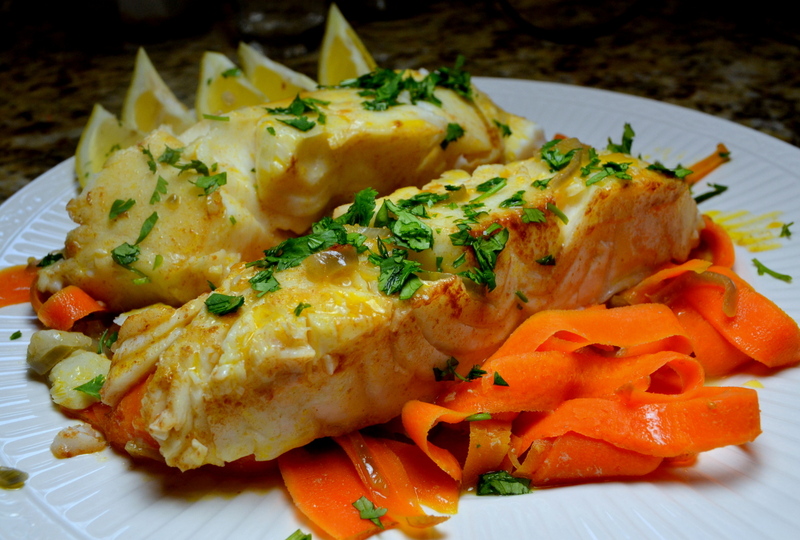 The fish is par-cooked on one side in melted butter, so that it is cooks evenly. My one problem was that I ended up overcooking the fish; after 10 minutes of braising, the fish registered 120-degrees; then 3 minutes later it registered 165-degrees. Opps. While I lost some of the firm texture associated with this premium-fish, the flavors were nevertheless delicious. 4-stars. Delicious dinner; but not worth the pricey fish. The recipe is delicious; the carrots and wonderfully flavored and bold. However, the carrots over-power the delicate fish. It’s not worth the premium price of $23/lb, when most of what you taste is the delicious carrots. I will definitely make this recipe again; but maybe using $7/lb cod. Tonight, I ate the fish and the carrots in separate bites; both were delicious. In fact, the carrots might have even been more delicious than the fish. The main version of this recipe (which is here) serves 4 people. It would cost over $50. Chris Kimball has this “online extra” version that essentially cuts everything in half. That is the version I cooked today. My oldest son will not eat fish (and only eats carrots reluctantly). Chris Kimball says that striped bass or sea bass make a good substitute for Halibut. Look for fish that is between 3/4″ and 1″ thick. Next time I am going to look for a less expensive fish. 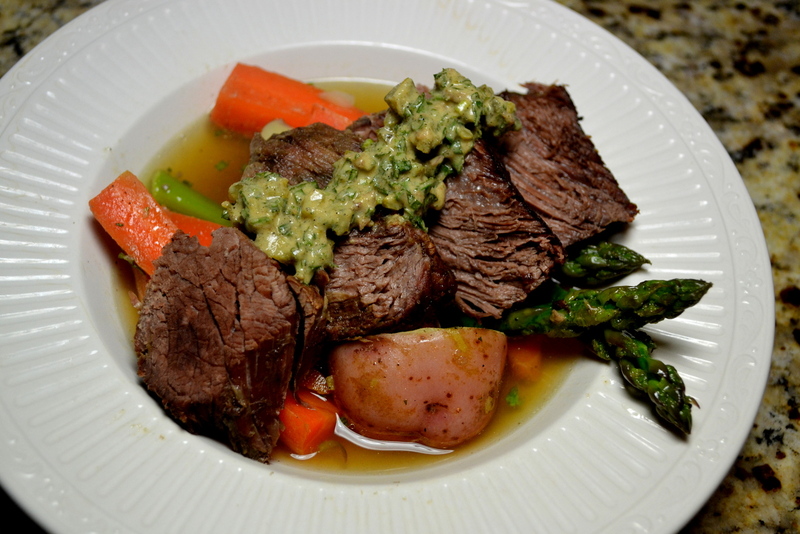 I cooked today using my 10″-skillet because by filets were relatively long. The original recipe calls for an 8″ skillet. Cut you fish into two 8-oz fillets. Sprinkle with 1/4 teaspoon salt. Peel the carrots, then shave then with vegetable peeler lengthwise into ribbons. Peel shallots, cut in half and slice thin. Set and 8″-to-10″ skillet over low burner and melt 3 tablespoons butter. Put fish in skillet, with the presentation side down, turning up burner to medium. Cook for 2 to 3 minutes until the butter begins to brown (fish should not brown), occasionally swirling the pan. Use a spatula to carefully move fish to plate, with the raw side down. With the skillet still over medium burner, add shaved carrots, shallots, 1/4 teaspoon ground coriander, and 1/4 teaspoon salt. Stir often for 1 to 2 minutes until the vegetables are beginning to soften. Add 1/3-cup wine and bring up to a gentle simmer. Return fish to skillet on top of vegetables with the raw-side-down. Cover skillet and adjust burner to maintain a gentle simmer. Cook for between 10 to 14 minutes; until the fish measures between 135 and 140 degrees. Add carrots, shallots, coriander, and 1/4 teaspoon salt to skillet and cook, stirring frequently, until vegetables begin to soften, 1 to 2 minutes. Add wine and bring to gentle simmer. Place fish, raw side down, on top of vegetables. Cover skillet and cook, adjusting heat to maintain gentle simmer, until fish registers 135 to 140 degrees, 10 to 14 minutes. 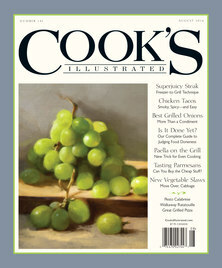 Remove skillet from burner, and use 2 spatulas to remove fish and vegetables to serving platter (or individual plates). Tent loosely with aluminum foil while you finish the sauce. Put skillet over high burner and cook for 1 minutes until the sauce has thickened. Remove skillet from burner and stir in 3/4 teaspoon lemon juice (from one lemon wedge). Adjust seasoning with salt and pepper according to your taste. Spoon sauce over the fish and sprinkle with cilantro. Serve with lemon wedges. For year’s I have been watching Gordon Ramsey yelling in Hell’s Kitchen about rubbery or raw scallops. While watching with amusement, I also clearly remember my only personal failure to make scallops four years ago. So when I saw that the current issue of Cook’s Illustrated (May/June 2015) included a recipe for Pan Seared Scallops, I was excited to try this “new recipe”. After already purchasing everything for this recipe, I realized they just republished the same recipe from 2009. Getting a great sear using a residential, gas range requires pre-heating the skillet on your most powerful burner for upwards of 4 minutes. I was a little uneasy pre-heating my non-stick skillet to such a high temperature (health concerns here). If you have a cast iron skillet you should use that. Otherwise, the recipe is very straight-forward. Cook the scallops for 1-1/2 minutes per side in a screaming-hot pan. After flipping, baste with melted butter while the second side cooks. Unfortunately, the basting technique tilts the skillet removing from direct contact with the flame. The cooled pan takes longer for the second side to sear. The bottom line if this: You have a choice between searing the second-side or cooking to only 115-degrees. Mine cooked to 130-degrees. 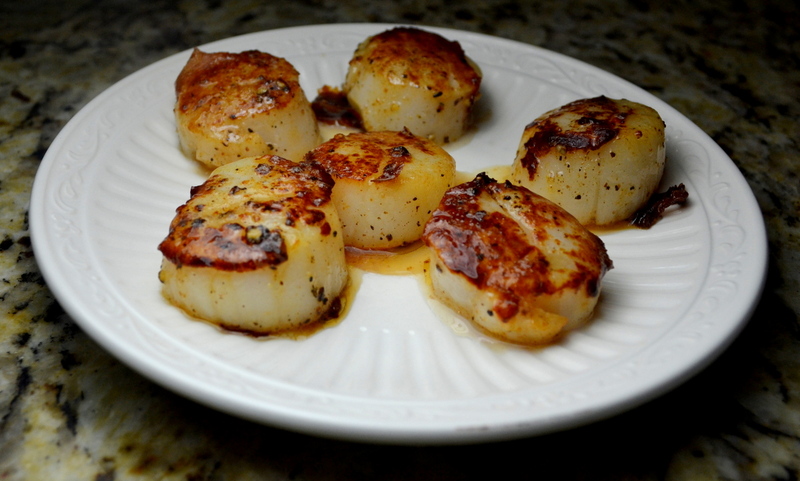 The recipe calls for dry sea scallop, which means that they are not treated with sodium tripolyphosphate (STP). I was disappointed to find out that the scallops packaging (from behind the fish counter in my supermarket) didn’t list the ingredients. I bought then frozen and they gave up so much liquid as they defrosted that I assume they were wet. Therefore, I brined the scallops as directed in Step 1. The recipe says to remove the tendons. I’m not 100% sure what those are, but I didn’t see anything on my scallops that could be removed. Start: 5:30 PM. End time: 6:15 PM. Remove tendons. If you can only find “wet” scallops, Add 1 quart cold water, 1/4 cup lemon juice, and 2 tablespoons table salt to a medium bowl. Soak scallops for 30 minutes. Put scallops on a baking sheet that is lined with a clean dish towel, then put a second clean towel on top of scallops and softly press down to blot away any liquid. Allow then to stand at room temperature for 10 minutes so that the towels will dry out the scallops as much as possible. Season both side of the scallops with salt and pepper. Set a 12″ non-stick skillet over high burner, add 1 tablespoon of vegetable oil a pre-heat for 4 minutes until the oil just begins to smoke. Add half the scallops to the pre-heated pan with the flat side down; laying down in a clockwise pattern (so that you can flip them in the same order you set them down). Cook for 1-1/2 to 2 minutes per side, without moving them, until they become well browned. Just before flipping, add 1 tablespoon butter to the skillet. Use tongs to flip the scallops and cook the second side, and tilt skillet so that butter runs to one side. Use a large spoon to baste the scallops with the melted butter as they cook. They only need to cook for between 30-seconds to 1-1/2 minutes. The sides of the scallops should be firm and the centers should still be opaque; and measure 115-degrees. Tent loosely with aluminum foil while you make the second batch. Use paper towels to wipe out the skillet and repeat the cooking process with the remaining scallops. Serve as soon as the second batch is ready with lemon wedges or an accompanying sauce. The secret to making delicious homemade lemonade is finding fresh lemons. Tree-ripened lemons are so much more delicious and flavorful than their supermarket counterpart. Upon arriving at my brother’s house in Las Vegas, the first thing I noticed was a small lemon tree with it’s branches bending under the weight of dozens of perfectly ripe lemons. My son made his first batch of homemade lemonade; absolutely delicious. 5-stars. Unfortunately, I don’t have my own lemon tree at home. So Chris Kimball offers some unique tricks to coax more lemon flavor out of supermarket lemons. I combined his recent tips together with his nearly 20 year old recipe for Classic Lemonade. The results were delicious; but takes an astonishing 6 hours (almost entirely unattended time). Overall, 4-stars. Still not as naturally flavorful as tree-ripened lemonade, but definitely worth making on a hot summer-like day. Chris Kimball has a trick to reduce the amount of sugar used (see here). Allowing the lemon juice to soak in lemon zest for 5 minutes allows you to reduce the amount of sugar by 10% to 25%, depending upon your personal taste. Lemon juice left to ripen in the refrigerator for 4 hours after squeezing have more complex flavor (see here). But Chris Kimball also warns that any longer than 6 hours the juice will begin to loose it’s flavor. If you want pink lemonade pink, add one tablespoon of grenadine. Always select thin-skinned lemons, that yield slightly as you squeeze then. They have more juice than thick-skinned lemons, even when the lemons were identical in size, shape, and weight (see here). Start: 10AM. End time: 4:!5 PM. Allow your lemons to come up to room temperature for 2 hours. Chill your 4 cups of water in the refrigerator (and allow to spend the last 45 minutes in the freezer; if you like really cold lemonade). Zest lemons into a small bowl. Juice lemons, adding juice into the same bowl with the zest. Allow to soak for 5 minutes, before straining into a serving container. Refrigerate the strained lemon juice for 4 hours. If you’ve let your lemon juice steep in the zest, reduce the 1 cup of sugar to between 3/4 and 7/8 cup. Add sugar to lemon juice, allowing it to dissolve and thicken for 5 minutes until into has a syrup consistency. Add the 4 cups of cold water, stir until combined. If you didn’t pre-chill you water in step 1; allow lemonade to chill in refrigerator for at least 2 hours. Next time, I will pound the chicken so that the thickest part of the breasts measures about 3/4-inch thick. The larger surface area will allow for more of a char, offering better flavor. When I cubed the thick part of the chicken, it was so thick that only one side of the chicken cubes had a char. Pounding it thin should double the amount of flavor in the chicken. 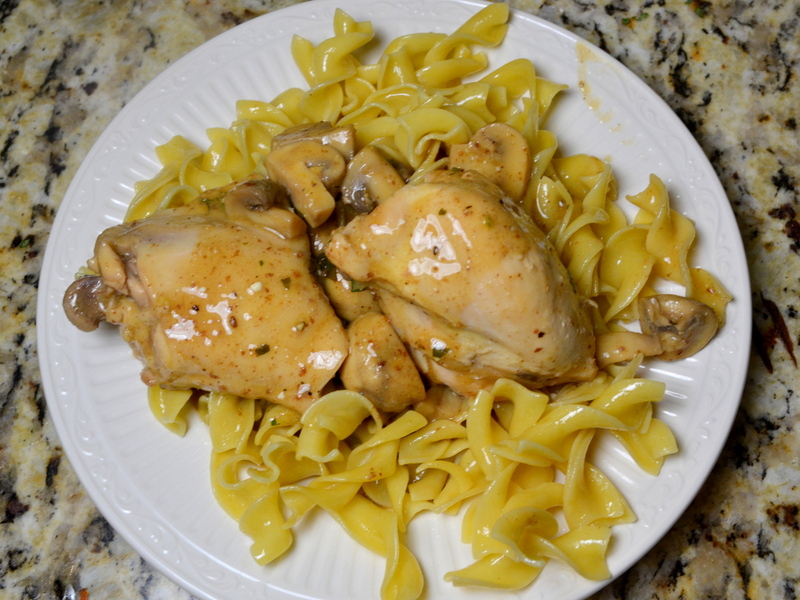 I might also try boneless chicken thighs, which I have been using lately in lieu of breasts. They not only have more flavor, but are more forgiving in terms of overcooking. They are also naturally thinner. Often times people are afraid to eat raw egg yolks; but there is no way around it in making Caesar salad. One of Chris Kimball’s prior recipe cooks the egg for a scant 45 seconds in boiling water. However, the yolk’s temperature only made it up into the 70’s; I am still eating raw egg. So why bother? It turns out that a USDA study found that only 1 in every 30,000 eggs is contaminated with salmonella, and that most of those are merely contaminated on the outside of the shell. This step helps mitigates that slight risk. Start time 5:30 PM. Ready at 7:00 PM. Trim the chicken breasts to remove any excess fat or skin. Pound the thicken part of the chicken so that the entire chicken is a consistent 3/4-to-1-inch thick. In a large bowl, whisk together 1/4-cup table salt and 1/4-cup sugar with 1-1/2 quarts of cold water. Add chicken to brine, cover with plastic wrap and put in refrigerator for an hour (or until the coals are ready; i.e. step 5). After chicken has been brining for 30 minutes, prepare your charcoal grill by completely opening both the top and bottom vents. Fill a chimney starter so that it is slightly overflowing (mounded) with briquettes and light, which will take about 20 minutes to fully ignite. Remove the chicken from the brine, and use paper towels to pat it dry. Combine 2 teaspoons milk powder and 1/4 teaspoon pepper in a small bowl and evenly sprinkle each side with half the milk powder, spraying each side with nonstick cooking spray to moisten the powdered milk. When the coals are ready, create a two level fire by emptying 2/3rds on half the grill, and the remaining 1/3rd over the other half of the grill. Pre-heat grate for 5 minutes then clean a rub with paper-towel dipped in vegetable oil. Put chicken with the skin-side down directly over the hottest side of the grill. Grill for 2-1/2 minutes, then flip chicken (leaving on the hot side) cooking the second side for another 2-1/2 minutes. Flip the chicken again (skin-side down) but over the cool-side of the grill; another approximately 15 minutes. Remove the chicken from when the internal temperature of the chicken reaches 160-degrees. Allow chicken to rest, uncovered, for 5 minutes before serving. When ready to top chicken, you can either slice or cube the chicken. Rip the romaine into 3/4″ pieces; then rinse and dry in a salad spinner. Peel garlic cloves. Press directly into a large bowl, and add lemon juice and allow to stand for 10 minutes. Meanwhile, minced the anchovies and use a fork to mash to form a paste (should have just under 1 teaspoon of paste). Grate the Parmesan cheese and set aside. Add Worcestershire sauce, minced anchovies, and 2 egg yolks into garlic/lemon juice mixture. Whisk until it is combined. While whisking constantly, slowly pour the canola oil and olive oil into the bowl. Whisk until the dressing has become fully emulsified. Finally, whisk in 1/2-cup grated Parmesan cheese and 1/2 teaspoon pepper. 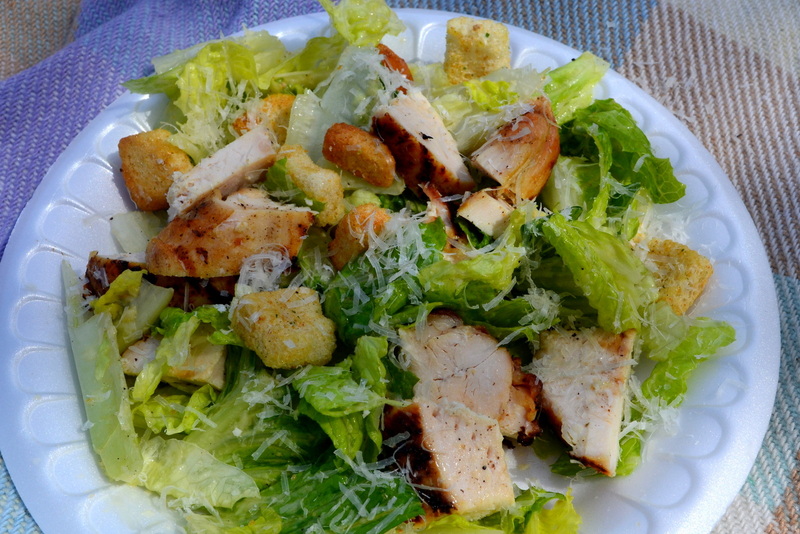 Add romaine lettuce to bowl and toss until the dressing is evenly coating the lettuce. Add croutons and gently mix gently. Slice the chicken crosswise into 1/2″-thick slices, or cube chicken into 1/2″ to 3/4″ cubes. Serve salad immediately on individual plates or bowls, then add sliced chicken breast on top of each salad. Pass the remaining Parmesan cheese separately. One of my all-time favorite recipes is Coq au Vin, with its deep, rich sauce; almost a demi-glace. Today’s recipe took an hour less than a standard, red-wine-based Coq au Vin, but I was skeptical when Chris Kimball lightened up its hallmark sauce using a white Riesling. The recipe resulted in great, well-balanced flavor. However, the sauce was a little too subtle; not bold or luxurious. Also, there was not enough chicken in the final dish; by the time I trimmed down my 5-lb whole chicken it was closer to 2-1/2 lbs of bone-in chicken. Given that the two recipes cost the same to make, I would choose the original Coq au Vin (even with the extra hour of cooking time). Overall, 4-stars; today’s recipe makes for an enjoyable meal. Using a 5-lb whole chicken left just over 2-1/2 lbs of bone-in chicken. Next time I think I will use 4-to-5-lbs of pre-cut chicken thighs. Because the pre-cut chicken would not provide me the back and wings (key to the recipe), I could still use some of the chicken trimmings that I always have in my freezer (for making chicken stock). The cooking times listed in the recipe were understated across the board. For example, browning the skin took 20 minutes, and browning mushrooms took 15 minutes. While the recipe calls for crème fraîche; I substituted a mixture of 50% sour cream and 50% heavy cream. There are a couple of variations of the substitution here. Chris Kimball suggests serving with buttered egg noodles or mashed potatoes. Chris Kimball says that Austrian Rieslings are a safe bet; as most are dry. In my store, every single bottle of Riesling was German. I did see that on the back label of some Rieslings there was a sliding scale indicating where the wine falls on the dry-sweet spectrum. but the few bottles that had the scale were all sweet. Finally, he says to look for Riesling that has 11% alcohol or above. The higher the alcohol level, the drier the wine. I found a $10 bottle that had 11.5% alcohol. The recipe left we with a glass to drink and it was indeed not a typically syrupy Riesling. Chris Kimball’s last alternative is to use a Sauvignon Blanc or Chablis. He specifically says to avoid Chardonnay, which will turn bitter as it reduces. Start time 3:45 PM. Ready at 6:00 PM. Break down your chicken, removing the into its major components, setting aside the wings and back (and the little bag that comes inside the chicken). Cut each breast in half; so you should be left with a total of 8 pieces (4 breast pieces, 2 drumsticks, 2 thighs). Remove the skin from chicken breast pieces, drumsticks, and thighs; setting aside to use in Step 3. Sprinkle both sides of chicken with a total of 1-1/4 teaspoons salt and 1/2 teaspoon pepper; set aside until Step 7. Chop bacon. Set a large Dutch oven over medium-low burner, add bacon and stir occasionally until it begins to render the fat, about 3 to 4 minutes. Add the chicken skin, back, and wings to pot, and increase burner to medium. Cook, stirring frequently, for 12 to 15 minutes. Mine took 20 minutes before the bacon browned. The skin should also have rendered it’s fat and the chicken back and wings should be browned on all sides. Meanwhile peel and chop your shallots. Peel and coarsely chop your carrots. coarsely chop the celery. Peel and smash your garlic (no need to mince or press your garlic). Temporarily remove the pot from burner and remove and reserve 2 tablespoons of the fat to small bowl; set aside until Step 10. Return pot to burner (still medium). 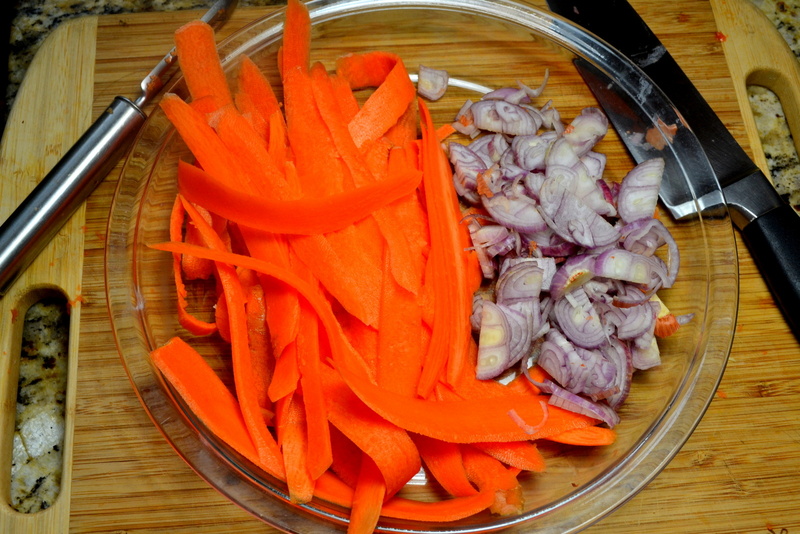 Add chopped shallots, carrots, celery, and garlic. Cook for 4 to 6 minutes, stir occasionally, until the vegetables become softened. Add 3 tablespoons flour and cook and stir for 30 seconds. Slowly add wine and deglaze the pan, using a metal spatula. Increase burner to high and simmer for 2 minutes until it slightly thickened. Add 1 cup water, 2 bay leaves, 6 parsley sprigs, and 6 thyme sprigs, and bring up to a simmer. Set chicken pieces in an even layer in pot. Turn down burner to low, cover pot, and cook for 25 to 30 minutes, stirring halfway through cooking. Remove the chicken pieces as each piece comes up to temperature; i.e. the breasts measure 160 degrees and thighs and legs register 175 degrees. While the chicken cooks prepare your mushrooms by trimming the stems. Cut small mushrooms in half and quarter any large mushrooms. Fish out and discard the back and wings. Empty the pot into a fine-mesh strainer set over a large bowl. Press down on the solids to remove as much liquid as possible. Allow to settle for 10 minutes, then use a wide spoon to remove and discard any surface fat. Return the cooking liquid to the bot and bring up to a boil. Reduce burner to maintain a brisk simmer for 5 to 6 minutes until the sauce has the consistency of heavy cream, stir occasionally. Turn down burner to medium low. Add in crème fraîche and minced parsley. Stir until combined. Add chicken pieces and any juices from the plate. Cook, covered, for 5 to 8 minutes until the chicken becomes heated through. Adjust salt and pepper according to your taste. You are currently browsing the My Year Cooking with Chris Kimball blog archives for May, 2015.